Making our heritage accessible to our community is a fundamental objective of our Trust. We possess many 'jewels' in this area, yet with the transient nature of life today much of this gets overlooked and will gradually disappear over generations. We will be publishing regular articles on our heritage in the newsletter sent to our members along with selected articles on this website. 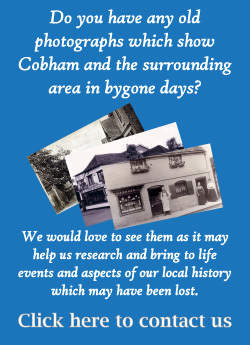 We are also keen to gather other articles, stories, documents and especially pictures which record the past and recent history of Cobham and the surrounding area. If you think you may have some or think your friends and relatives may have some, do get in touch as old photos, documents and memories can so easily be lost forever. If you would like to get in touch please visit our Contact Us page.